- NJPW Sumo Hall (February 22, '89) = Zangiev fought to a 5-Minute Draw with Salman Hashimikov. Later on, Zangiev beat Osamu Matsuda. - NJPW Super Power Clash (April 24, '89) = Zangiev pinned Buzz Sawyer, then fell to Shinya Hashimoto in the IWGP Title Tournament. Big Van Vader won the tournament. - NJPW Sumo Hall (August 10, '89) = Zangiev was beaten by Osamu Kido. - NJPW World Cup Tournament (November/December '89) = Zangiev was beaten by Steve Williams. Riki Choshu won the tournament. - NJPW Sumo Hall (December 7, '89) = Zangiev & Salman Hashimikov lost to Brad Rheingans & Steve Williams. - NJPW In USSR (December 31, '89) = Zangiev was pinned by Riki Choshu. - NJPW Super Fight (February 10, '90) = Zangiev fell to Brad Rheingans. - NWA Starrcade '90 (December 16) = Team USSR (Zangiev & Salman Hashimikov) defeated Team Canada (Danny Johnson & Troy Montour), then lost to Team Japan (Mr. Saito & the Great Muta). Team USA (the Steiner Brothers) won the Pat O'Conner Memorial International Tag-Team Tournament. 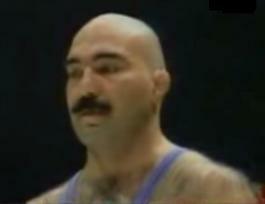 - UWFI Shootfighting II (April 13, '94) = Zangiev lost to Yoji Anjoh. - UWFI Budokan Hall (May 6, '94) = Zangiev forced Yuko Miyato to submit. - UWFI Budokan Hall (June 10, '94) = Zangiev & Salman Hashimikov defeated Yoji Anjoh & Kazuo Yamazaki. - UWFI Budokan Hall (August 18, '94) = Zangiev & Vladimir Berkovich fell to Yoji Anjoh & Naoki Sano. - UWFI Budokan Hall (October 8, '94) = Zangiev lost to Nobuhiko Takada.